I landed in Bangkok at midnight and was feeling overwhelmed trying to leave the airport so I rented a private car to my $6/night hostel. The room is very small and dirty. Last night I slept with my backpack on my bed, I didn't want it to touch anything. I have a feeling I will not be changing out of my plane outfit for a few days. I can't imagine unpacking. This morning started a little rough as I tried to adjust to the crowds, the heat, calling internationally from a payphone and finding my way around on a hand drawn map but by the afternoon things had really turned around. 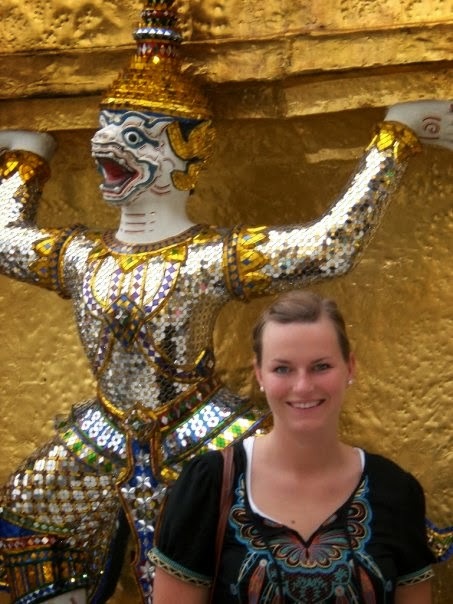 My first South East Asia sightseeing mission was the Emerald and Reclining Buddha. After thinking I was lost I luckily bumped into them (my hand drawn map wasn't getting me too far). Both were amazing. 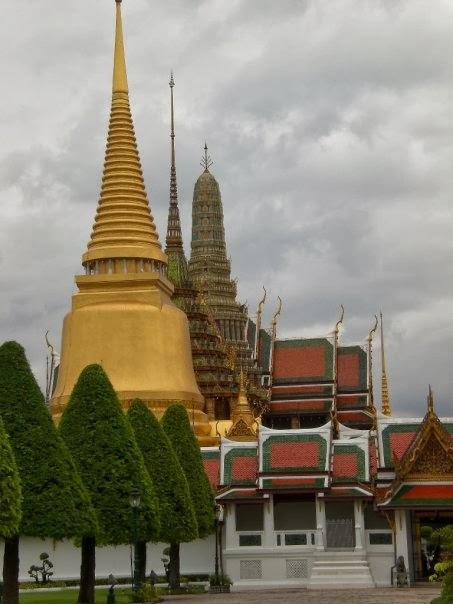 I then went off to the Grand Palace which was so gold and gorgeous. Before entering I had to wrap a skirt made out of Thai fabric around me. I had not followed palace dress code and my dress was above the knee. Overall, I was really having a pleasant morning but adjusting to being alone and not being able to share these moments with anyone I knew was taking a tole on me. After my overpriced fruit for lunch (I went to a restaurant, the food stalls are intimidating) I started walking back to my hostel so that I could lay down (I was a bit of an emotional wreck at the time so I thought it was best to get out of public). On my walk back a tuk tuk driver offered to drive me around to see Bangkok's top sites. What the heck, 20 baht to see a bunch of sites sounds like a great deal to me! As I was about to go inside the first stop, a marble Buddha, my tuk tuk driver showed me the sites on his map again but this time he also pointed to a gas station. This extra stop terrified me and I was wondering what I had gotten myself into. As I walked into the temple worried, there was another tourist couple walking out and getting into their tuk tuk. 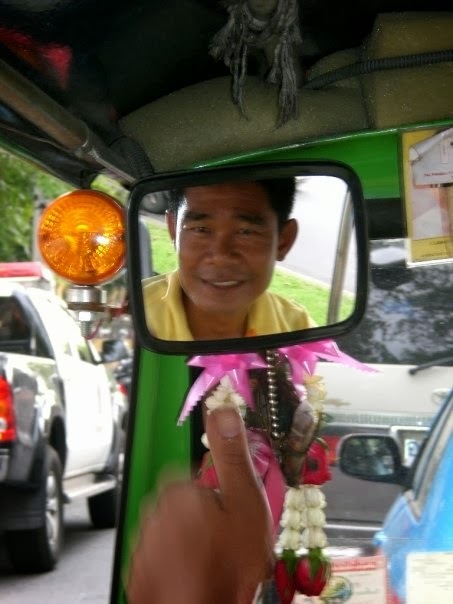 For some reason this calmed my nerves even though we were in totally different tuk tuks. I also asked a Thai man inside the temple who spoke excellent English if it was okay if my tuk tuk driver took me to the gas station and he said that it was a Monk holiday and the gas stations were giving them discounts if they had passengers with them. Tourism, I tell ya. By the third or fourth stop I started looking forward to riding around the city with him... he was an excellent tour guide and driving around the crazy streets of Bangkok really was exciting. Along with the sites he also stopped at high end fabric/ jewelry shops where he told me I had to go look around, I did not have to buy anything I just had to go inside. The hilarious part was whenever we were arriving or leaving one of these shops there would be dozens of other tuk tuks coming and going with tourists. It made me laugh knowing we were all getting shuttled around the city to these shops in between sightseeing Bangkok. I would have never guessed that my tuk tuk driver Neon (that is how you say his name, I have know idea how to spell it) would have really turned my day around!